End of last week in the network circulated a list of Sony smartphone models that are scheduled for the year 2013. And on that list were Nueheiten some promising smartphone. But now is a Sony C660X - Codename Yuga - emerged, which will probably be the Sony flagship next year. For its specifications have it in you. 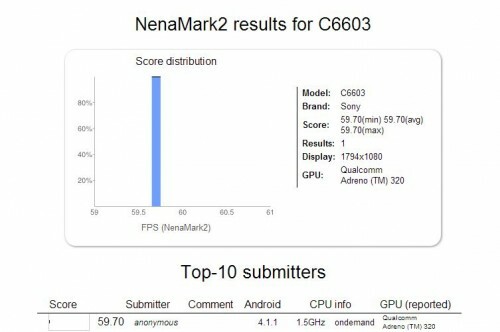 Sony builds excellent smartphone models, "complain" but some Android users, including that were not absolute high-end smartphone models. The Sony will probably change the 2013th Because the Sony C660X "Yuga" is the famous Snapdragon S4 Pro quad-core processor and probably a 5-inch display with full HD resolution. 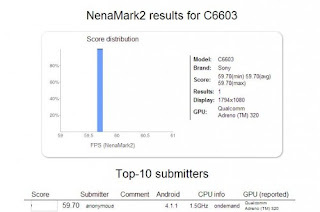 The benchmark is the Sony NenaMark2 C660X "Yuga" some technical details known about the resolution is 1794 x 1080 pixels, the missing 126 pixels are probably required for the on-screen buttons. The presumed 5 inch display Android smartphone will probably come from Japan Display Inc., this company was founded jointly by Sony, Hitachi and Toshiba. SONY C660 X "YUGA" is SONY FLAGSHIP 2013? With the Sony, the Japanese C660X could finally move into the league of the absolute high-end smartphone models. Actually, it was also foreseeable that they would no longer sit at Sony "only" dual-core processors. But now you could with the Sony Yuga one or another manufacturer to compete mightily.